A winner of a guide to DNA testing. Any time The Legal Genealogist can say those three things about a book — and particularly about a book on a topic that can be as hard to comprehend as DNA testing — you know we have a winner. Now… before I go further, the disclosure: I received a free copy of this book to review.2 I assure you, getting something priced as of this morning at $19.99 for free isn’t going to influence me one bit. If there is a price at which I can be bought off, it’s going to be a whole lot higher than that! I use the term “informative” here to denote the depth and breadth of the coverage of this new work. It begins in Part I with an overview of Getting Started. The first chapter, Genetic Genealogy Basics, reviews the very basic elements of DNA: what it is, how it works, what the tests are that can be used for genetic genealogy. And that very first part adds the emphasis that’s so important on one other aspect of DNA testing: Ethics and Genetic Genealogy, an overview of the ethical considerations that are part and parcel of conscientious and responsible testing. See what I mean? Informative. I use the term “understandable” here to denote the fact that… sigh… this book is written in plain English. The word choices, the explanations, the examples all appear to have been selected to make things as understandable as possible for the person struggling to add this new technology effectively to the genealogy toolbox. Yes, there are scientific terms used in the book — unavoidably. But where a term like heteroplasmic is used, as it is in chapter 4, or meiosis in chapter 6, there’s a glossary entry to explain it as well. I’m not promising you won’t have to work occasionally to grasp what’s being said. But wherever possible, it’s obvious that the author went above and beyond to make things as simple and clear as possible. Finally, I use the term “solid” here to denote the depth and breadth of the supporting data, particularly the graphics and charts and appendices which add so much to our understanding of this topic. 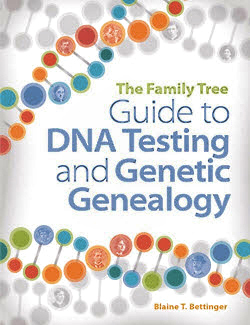 From visual depictions of our genealogical and genetic family trees in Chapter 1 all the way through comparison guides and research forms in the appendices, there’s a wide variety of information presented in depth and with clarity to aid our understanding of the tests and our ability to apply them in our own research. It follows with a chart guide to choosing the right DNA test, a chart comparing the tests, and a testing company comparison chart which — as the author undoubtedly knew would happen — is already outdated: 23andMe has just announced a new ancestry-only test (leaving out the now-not-all-that-useful health testing) for $99, down from the $199 shown. These and other bits and pieces of supporting data make this book solid. Any time I can say a book is informative, understandable and solid, we have a winner. Thanks for this Informative. Understandable. Solid. review of Blaine’s work. I have been waiting for a good book to recommend to students of DNA and Genetic Genealogy. This is it, between the photos for clarity and easy language when possible WOW! Thank you Judy of a great review. The wait is definitely over. This is really solid. Judy, I have purchased Blaine Bettinger’s and Debbie Parker Wayne’s “Genetic Genealogy in Practice,” which has lots of information as well as exercises. Do you know if the two books are complementary or duplicative? I haven’t finished my review of the NGS book yet but my initial review says complementary. It seems to me so far that this book is a reference and resource book, the NGS book is a workbook and apply-what-we-learn book. Great review! I’m working through it now and am very impressed with Blaine Bettinger’s well-organized and clearly written text. So far, the book is right on target. It and the new NGS book will indeed be complementary to one another. Look for Drew Smith to review both books soon on our “The Genealogy Guys Podcast” and to interview Blaine on the “Genealogy Connection” podcast too. A good text, approachable by beginners and sensibly available as an eBook. (The overflow from my bookshelves long ago took over the spare room.) Surprisingly that book has much towards advanced use also. Hopefully the NGS book has detail on autosomal triangulation as well as yDNA haplogroup work. Already testing labs have made some changes that make a little of the text outdated, but this field is a moving target and that is inevitable. Good on Blaine for a very solid effort. I used to think he tended to overdo ethics, but recent public and private utterances from a range of people have shown me that he has pitched that part just right. What about searching for biological family if adopted? There’s a chapter of the book on genetic testing for adoptees. What is the NGS book? It’s called Genetic Genealogy in Practice and you can read about it here.